I love hearing about cool products. And when I find products I love, I want to tell everyone I know about them. So I'm starting up a fun little weekly post (or bi-weekly, or whenever I feel like posting them...don't really want to set myself up to fail) that will feature a product that I am smitten with. 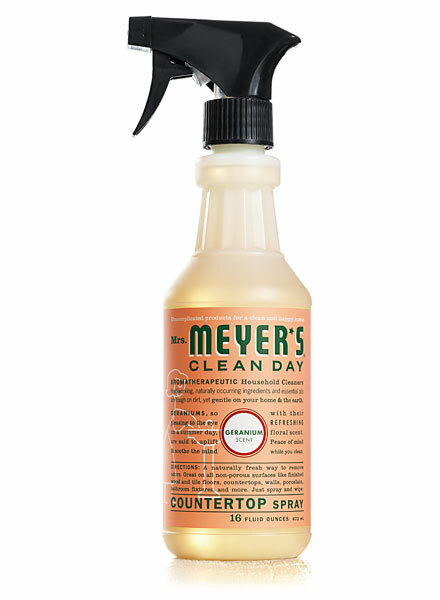 Today I want to tell you how much I love Mrs. Meyers countertop spray in geranium scent. I love that I can disinfect my kitchen and have it smell like flowers instead of chemicals. I love Mrs Meyers products in general because they use great smelling natural essential oils, but the countertop spray is my favorite. What cleaning products can you not live without?